The holiday season is filled with parties and cocktails are an important element. For a delicious semi-sweet after dinner cocktail Zachary Blair, the lead mixologist at KANU Lounge at Whiteface Lodge, created a fun cocktail he calls Rudolph's Milk. This libation is inspired by the three things Zach loves most about the holiday season: the story of Rudolph, thin mints and candy canes. The cherry float bottom represents Rudolph’s red nose, the chocolate syrup reminds him of tasty thin mints and the peppermint syrup incorporates the minty flavor of his favorite holiday candy. 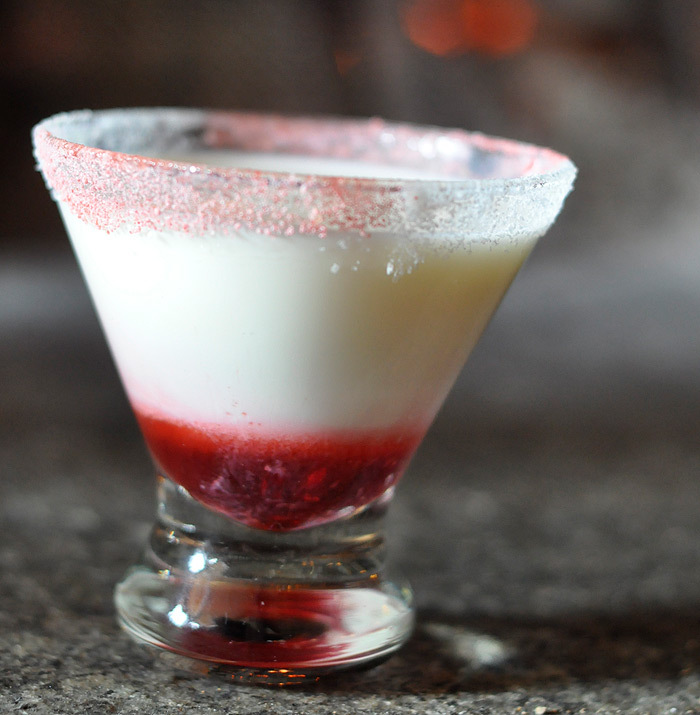 Shake first 4 ingredients together and strain in glass rimmed with crushed peppermint candy.Pour in bottom float. Enjoy! It's so pretty! Looks delicious! super cute! Will you be my bartender? That looks so tasty! Such pretty colours. Omg. This sounds insanely amazing!! Make mine a double. I foresee LOTS of people getting extremely DRUNK off of this! LOL! This is really, really pretty! The color is fabulous. How creative! I think I should leave this for Santa!